I have been fascinated with the concept of bazaars since my childhood. Growing up in Pakistan, my mother used to go to the Sunday market – otherwise known as the farmer’s market – and buy loads of fresh vegetables and fruits. Our house was known for the variety of fruits and food items that my parents very lovingly picked out. We never ate out, and thus we were those fast- food -deprived children who always wondered when other people talked about a new restaurant. The source of this dietary routine was the farmer’s market. Half of me loathed these markets and the other half loved them, with the people standing in rows behind tables full of food, yelling to attract the customers. These markets reminded me of the bazaars from the Thousand and One Nights, a narrative that filled a large part of my childhood. From Sinbad the Sailor to Ali Baba and the Forty Thieves, bazaars retain a very special place in the action of the stories. Intricate plots and the role which bazaars played in those stories made me further romanticize the notion of these markets. And to date, whenever I visit a different country, I look for a bazaar as a place to connect back with my childhood days. This summer, living in Berlin, I rediscovered my childhood farmer’s market, which many of us know as Turkish markets. It was only while having a delicious meal with Aya Ibrahim, a classmate from Egypt, that I discovered the Turkish Market in Berlin. I have been lucky to go there since that day. 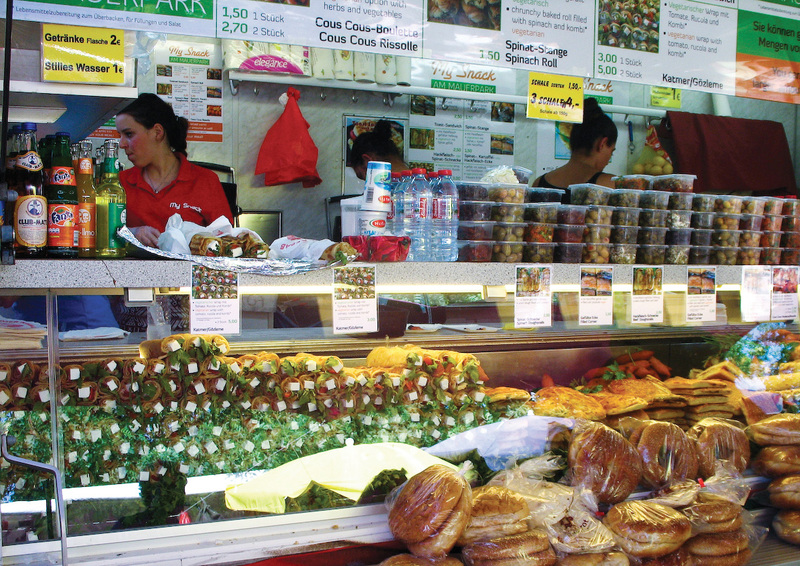 The Turkish market is a heaven for those who want to buy cheap yet healthy food in Berlin. Fruits, vegetables, fish, meat, and poultry – one finds a large variety of food displayed at the stalls, being sold by interesting, cordial and mostly enthusiastic sellers. Most of the sellers are Turks residing in Berlin, but I also came across German and Spanish sellers. The beauty of the market lies in its both being crowded and cozy. It was like being home. It was an interesting social experience rather than hectic time out for grocery shopping. As I walked through the Turkish market I saw men and women smiling, and in very amusing manners inviting customers to come in, as well as sellers and the buyers arguing over food prices and quality. One sees people from all walks of life, from students to tourists and people from a variety of ethnicities, etcetera. The lovely Turkish market and the aroma of the various spices, vegetables and juicy fruits transported me to the bazaars of the Thousand and One Nights – colorful, loud and warm.